I hate it when companies introduce unpopular charges and then weasel their way out of explaining it to their customers. Did they think that no one would notice? Or that they'd be happy about it? Or that their business customers would shrug it off? I searched their web site press release page, and found nothing. How surprising. It's in their 2011 Bank Fees document, but that's about as far as it goes. It has a section on deposit fees, but deliberately avoids mentioning the cheque deposit fee, although it mentions that cash deposits at an ATM are free. Evasiveness is not that different to dishonesty. GOOD GOD!!!!!!!!!!!!!!!!! IS THERE NO LIMITS TO THE WAYS IN WHICH YOU WILL RIP US OFF??????????????? Now my biggest customer is having to charge R12.49 for any cheque payments under R1000, even if the cheque is from another bank. That's because R12.50 without VAT is R10.964, so rounding it off to the nearest cent and then adding VAT gives either R12.49 or R12.51. What a nightmare. On 1 January 2011 Business Bank introduced a cheque deposit fee of R12.50 for each cheque deposited. Following further feedback received on this matter, we have decided to suspend the cheque deposit fee with immediate effect and reverse all cheque deposit fees that have been incurred by yourselves from 1 January 2011 to date. Please note that this is a fee suspension and not a fee withdrawal. The intention remains for the Bank to promote alternative forms of making and receiving payments that are more affordable, more secure and faster to use. Where it becomes necessary to review our position on this matter, we will do so and advise you accordingly. That's the closest we'll get to the bank admitting that it screwed up. I guess they can always blame it on "the man with the melon hat". 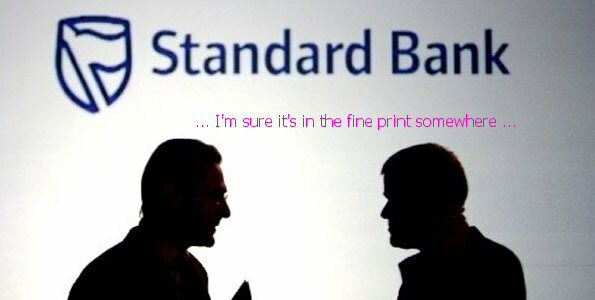 That's why I no longer bank with the (sub)Standard Bank. I'm glad I no longer bank with them. I moved to FNB several years ago and I'm glad I did. There are more surprises in store for their loyal business banking customers. There is also an additional R28 per month "Monthly management fee". This is of course in addition to the increased "Service fees" and "Overdraft service fees". This fee does appear in the 2011 Rate card but the three people (Upper management) that I have spoken to today are all being very evasive and refusing to acknowledge that it has been introduced. No wonder the 2011 charges were never sent out with the Dec statements.